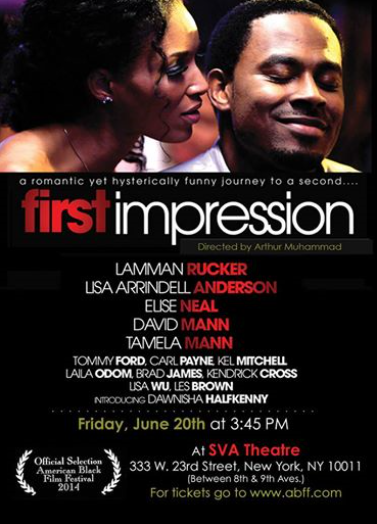 Cast: Lamman Rucker (Vernon Richardson), Lisa Arrindell Anderson (Imani Townsend), David Mann (Pastor Wayne Johnson), Elise Neal (Kym Pine), Tamela J. Mann (Renee Wells), Kendrick Cross (Julius), Kel Mitchell (James Mason), Brad James (Scorpion Kiss), Lisa Wu (Katrinah), Laila Odom (Tropical Storm), Tommy Ford (T), Carl Anthony Payne, II (C), Dawnisha Halfkenny (Tryanna). Story: When a man finds a woman, who seeks a man, he only gets one chance at a First Impression…or does he? First Impression is a romantic comedy that takes you on an enchanting journey into the complex world of Internet dating. Completely unaware of their secret fantasy relationship in cyberspace, a twist of fate brings the real Vernon and Imani together where the pair hit it off instantly. But when the truth of who they really are is revealed in a bizarre trail of events, the game-changing question is: Can there ever really be a second chance at a “First Impression”? (Source(s): Facebook Page; firstimpressionmovie.com; IMDB).